There are currently 141 people online. 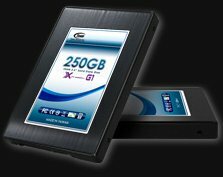 Team Group has introduced the Xtreem G1 and R solid state disks, both series feature 60GB, 120GB and 250GB disks. The fastest Xtreem G1 SSD has a read speed of 260MB/s and write speed of 180MB/s, while the fastest Xtreem R SSD has a read speed of up to 220-240MB/s and write speed of up to 150-170MB/s. Full specifications can be found over here. The rapid advances in computer processing technology has seen CPU and memory speeds outstrip that of conventional mechanical hard disks. This is why it is increasingly being replaced by newer Solid State Disk (SSD) technology. To meet the overclocking needs of high-level enthusiasts, Team Group Inc. has once again leveraged its extensive technical expertise to launch the all-new Xtreem SSD series. First in the series are the Xtreem G1 and Xtreem R-type. In addition to being quiet, light, energy-saving and shock resistant, the Xtreem G1 and R-type pushes SSD read speeds to a breath-taking 260MB/sec and write speeds to a respectable 180Mb/sec. Compared to thick, heavy conventional 7200RPM HDDs with a read speed of just 80MB/sec and write speed of just 60MB/sec, Team's Xtreem SSD is a Ferrari that easily pushes the edges of the speed envelope. The Xtreem SSD G1 solid-state disk supports the latest DRAM Cache technology and uses 64MB of SDRAM Flash Memory to cache and sort the most frequently used data and digital files. This speeds up file access and allows even the most complicated instructions to be completed in an instant. With the SATA II interface, read speeds can reach up to 260MB/sec and write speeds up to 180MB/sec. This is ten times that of conventional HDDs and more than twice as fast as other SSD products now on the market, making every mouse click as responsive as the opening of the toolbar. The Xtreem SSD R-Type solid-state disk has a built-in RAID chip that delivers a massive boost to access speed and stability using “Redundant Array of Independent Disks” technology. With average read speeds of between 220MB/sec ~ 240MB/sec and write speeds of around 150MB/sec ~ 170MB/sec, it's like a cat among pigeons compared to all retail SSD specifications now available. For high-end business notebook users, it offers a perfect way to enhance every presentation. Apart from fast transfer rates, the Xtreem SSD series also comes equipped with the standard Wear leveling and ECC features to make SSD the technology of choice for the next-generation of IT products. Three capacities are currently available for the Xtreem series: 60GB, 120GB and 250GB.